So I have something a little different to share today. I've got this fun little card that I made. 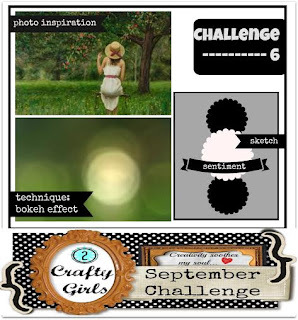 It is actually part of the 2 crafty girls challenge, but I made it for the Memory Nest since they are sponsoring it. I'm glad I only had to make a card though because I was traveling to New York and I did some camping out in the Adirondack wilderness with out internet access for a few weeks. Well, I did find a very large rock that I could climb and get a little bit of a signal, but it wasn't much! Then we flew home and had to do lots of kindergarten prep stuff. My not so little girl starts school tomorrow! Craziness! Anyways, this is the first card I've ever made for a challenge before. I've only made cards a few times before. It's defiantly a bit out of my comfort zone! The octopus was supposed to be a stamp, but it was too small, so I just drew it bigger. I was very determined to make a card with one. I have no particular reason why, but I just really wanted to!